RETIREMENT DOES NOT CHANGE WHO YOU ARE. Consider the cost of ownership and your preferred lifestyle when selecting a 55+ community, and replace excessive hyperbole with buying power. True Story (and the inspiration for writing this article). I recently played a round of golf here in Ocala, FL at one of the many championship courses. Because it was off-season, I paid $12 for eighteen holes with a cart using one of the discounted booking sites. During the “snow-bird” season, it may cost twice that (still ridiculously cheap). I was paired up with a retired gentleman by the name of Tom whose passion was the game of golf, and he was far better than I am. As golfers do, in their brief encounters with kindred souls, we chatted intermittently and got to know each other a bit. I asked how often he played, and he said twice a week in the summer, but only once a week from December through April, because the price doubled and he was living on social security. He said he lived in one of those national builder “Active Adult” communities in a two-bedroom villa. Although I knew the answer, I asked what the HOA fee was. “$415 a month,” he said. I replied, “Well, Tom, I suppose that includes all those nice amenities that community has.” He answered, yes, but that he really doesn’t make much use of them. I mentally tabulated that had he, instead, purchased in a type B community (mentioned later), he would save $4600 a year in HOA fees and this would yield 250 rounds of golf year-round. In other words, he could pursue his passion every day for the rest of his life if he wanted to. Instead, Tom is sitting alone at home watching the golf channel and polishing his clubs in anticipation of his next carefully budgeted tee time. As a realtor who has spent much of his career specializing in retirement communities, the first thing I ask customer is, “What kind of lifestyle do you envision?” Not surprisingly, many folks have not thought about it quite thoroughly enough. Sometimes, even long-time spouses have different opinions of what they are looking for. It saves everyone a good deal of time and future disappointment to sit down and refine these goals at the outset. Retirement does not change who you are. It’s not a complete makeover. You will enjoy what you enjoy now; you’ll just have more time for it. In many of the newly constructed 55+ projects, (Let’s call these Type A), the amenities such as clubhouse, gyms, pools, and activities are akin to a resort destination. These are the national builder “Active Adult Communities” whose billboards and commercials feature two incredibly good looking 55 year olds, biking, dancing, playing tennis, golf and laughing gleefully while dining on lobster at a 5 star restaurant; apparently all in one day. If you are (right now) a super gregarious, let’s-go-on-another-cruise personality, this is your kind of place; however, if the lifestyle you imagine is mainly generated by the allure of what you have seen advertised, think again. Type B – Here you buy a home in a smaller 55+community with perhaps a clubhouse, a pool, and some scheduled activities. You may pay a very low HOA fee for such a community, yet there is ample opportunity to meet your neighbors at gatherings and activities, but that is something you initiate, or not. You might be the kind of person who would prefer to stay home with a good book or garden rather than chat with a bunch of strangers. If you want to go out dining and see a show or a concert, there are plenty of good restaurants and venues in the area. If you like golf, yoga, or welding classes, you have many choices nearby. Think of it as retirement amenities ala carte. Type C – Just the right house. I recently met with a retiree who explained that he just wanted to take his boat out fishing whenever he wanted. I found him a lakefront home with a boat dock for around $200k. It was well within his budget since there was no HOA fee at all. I also found a perfect home in a great neighborhood for a couple who are also avid golfers. The home is a very nice, upgraded 3/2 home in a quiet neighborhood five minutes from their favorite golf course for under $175k. Now, you might be thinking, “Why didn’t Mike help first-paragraph-Tom?” I will. Since I never talk business while playing golf, I did not mention that I am a realtor, but we got along so well, we have planned another round in a week. Afterwards, I will sit down with him, and offer my services to get him out of that rut by selling his villa and getting him into an appropriate place. 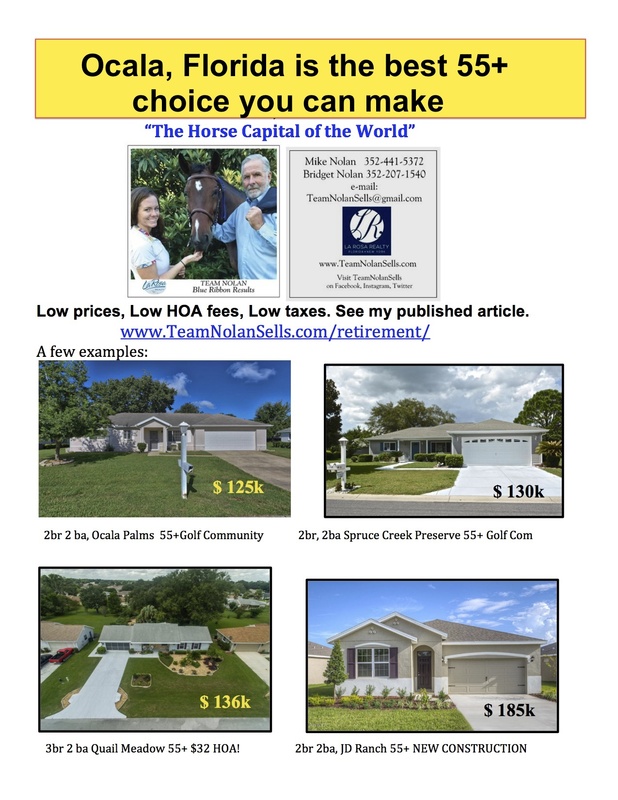 You can buy a very nice single family home in a 55+ community here in Ocala for $125-200k, but one often overlooked aspect is the full cost of ownership. Property taxes in the Ocala area are very reasonable at around 1% per year of the value of your home. HOA fees can vary greatly, however, from $32 per month for a community with perhaps a clubhouse and a pool to over $400 per month for all the whistles and bells (add on an initiation fee). If you look at the opportunity cost of money, each $100 extra in HOA fees represents $30,000 in buying power, or in Tom’s case, five rounds of golf. So you should weigh the choices between getting that third bedroom, the sunroom, disposable cash; or the community with the pickle-ball courts, pottery classes, and a full time masseuse. Why Ocala? The short answer is because it’s not a tourist destination. Did you know that the same national developer will charge you 50% more for the identical model in one of the more well known cities such as Orlando? And in those areas, it’s 50% more for taxes and HOA fees. For what? Cement and façade everywhere you look, tourists with their fatigued children reeking of disappointment and cotton candy, and highways to nowhere. Some retirement! Ocala, on the other hand, is the “Horse Capital of the World”. Beautiful rolling scenery with pastures and horses in every direction. Enjoy a walk in the historic district and Downtown Square, browse antique shops and savor delicious dishes from an impressive collection of eateries. Whether you want a mall or little shops, you will find it. There are top-notch medical facilities, theatre, and the Arts. It is less than an hour from Gainesville, home of the University of Florida, and only a short drive to either the Gulf, the Atlantic, or pristine lakes. So if you are planning to retire in Florida, consider the Ocala area. I would be happy to help you find what you need, keeping the three A’s in mind – Affordability, Activity, and Accessibility.